With the nuclear deal approved in the US and India getting a NSG waiver to begin trade in nuclear material it is evident that India has much improved its relations with all the developed nations. India's relations with Pakistan has dramatically improved over the last few years. But how are its relations with countries like Afghanistan, Iraq and Iran which generally worry the developed nations around the world? The government of President Hamid Karzai is currently focused on securing continued assistance for rebuilding the economy, infrastructure, and military of the country. It has continued to maintain close ties with the United States, India, Iran,the European Union, and the Islamic world. The bilateral relations between the Republic of Iraq and the Republic of India have been traditionally friendly and collaborative. They advanced considerably during the rule of Saddam Hussein in Iraq in the 1990s over strategic issues, oil and commerce. 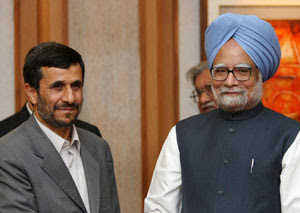 Although initially disrupted during the 2003 invasion of Iraq, diplomatic and commercial ties between India and the new democratic government of Iraq have since been normalized. India had preserved its neutrality over the U.S.-led invasion of Iraq, criticizing the lack of U.N. approval, but also hinted that it would consider sending troops to post-war Iraq to help maintain security and peace after a unanimous vote in the U.N. Security Council over the Coalition's presence and mission in Iraq.However this was ruled out after protests from public and political parties which have been opposing USA. It normalized its ties with the new democratically-elected government of Iraq in 2005, seeking to restart trade and co-operation. Indian businesses applied for contracts for reconstruction projects to the Coalition Provisional Authority, and more recently the activities of Iraqi businesses in India have been growing rapidly. Currently, the two countries have friendly relations in many areas. There are significant trade ties, particularly in crude oil imports into India and diesel exports to Iran. Iran frequently objected to Pakistan's attempts to draft anti-India resolutions at international organizations such as the OIC. India welcomed Iran's inclusion as an observer state in the SAARC regional organization.Lucknow a city in India continues to be a major centre of Shiite culture and Persian study in the subcontinent. There are also small communities in India who trace their ancestry to Iran.